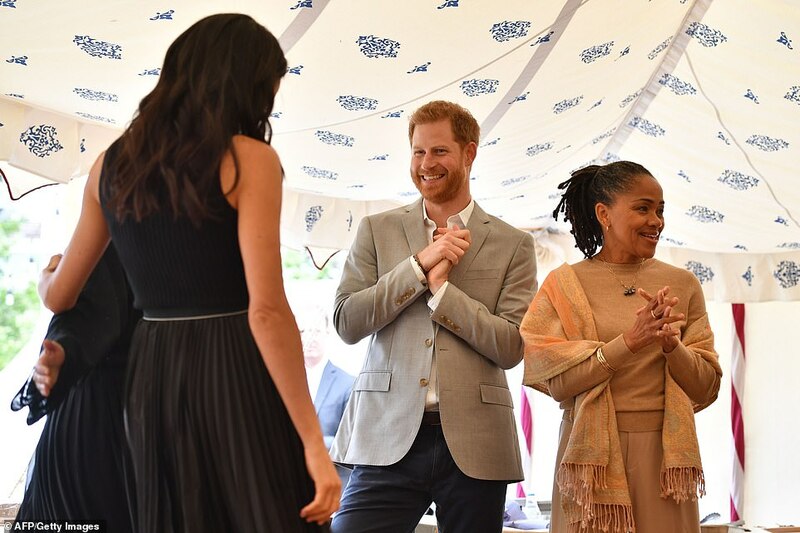 The Duchess of Sussex's mother Doria Ragland made a surprise appearance today at the launch of her daughter's new cookbook at Kensington Palace, telling guests: 'Hi, I'm Meg's mom'. 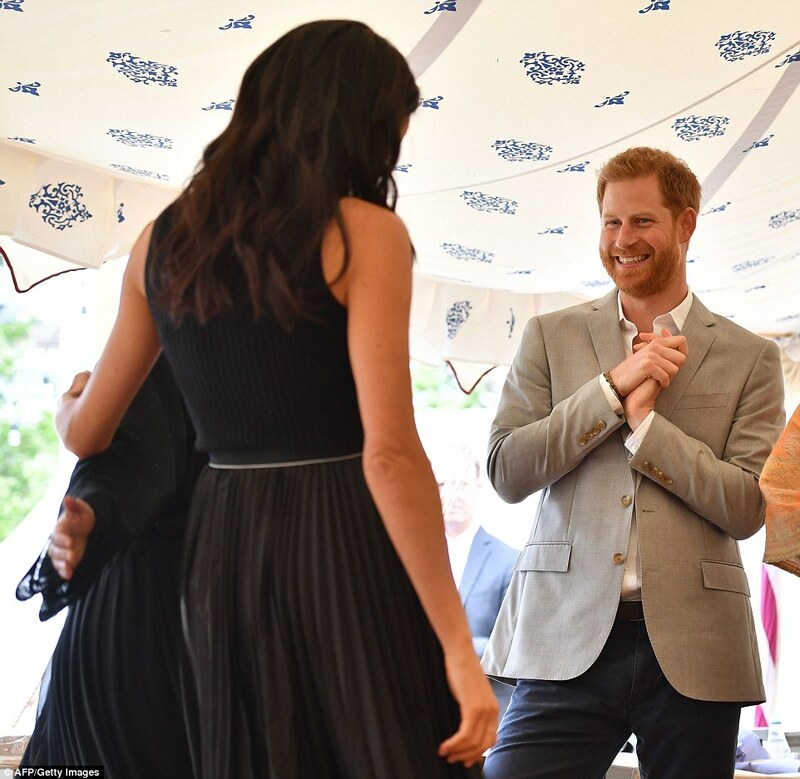 In an unprecedented move, Meghan invited her to the event, and they appeared together in public for the first time since May's royal wedding. It is unheard of for family members to attend official royal engagements. 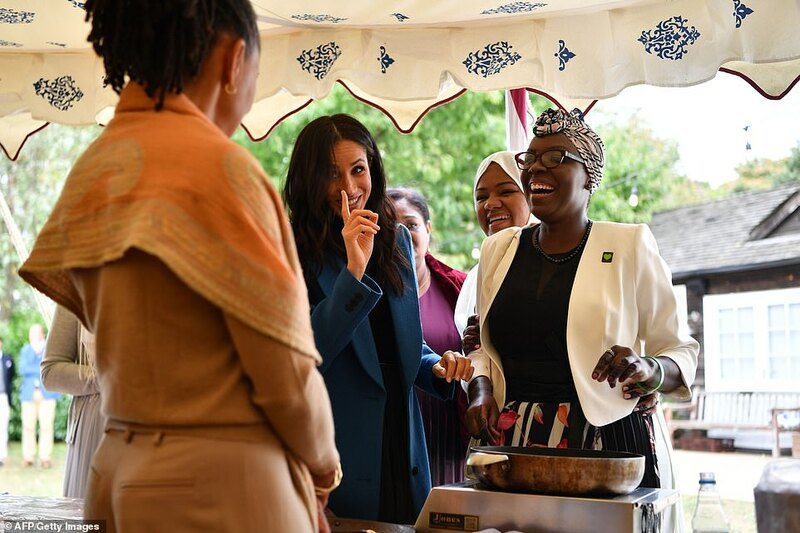 During the event, which Prince Harry also attended, Meghan spoke of how important the multi-cultural Grenfell kitchen was in making her feel welcome in London, saying she was 'proud to live in a city with so much diversity'. 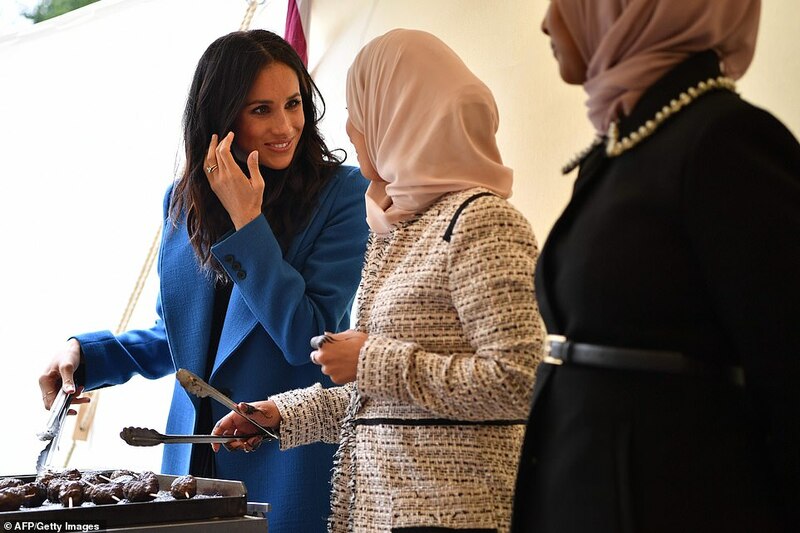 The duchess, 37, who hosted a lunch for the women of the Hubb Community Kitchen and their families, said she had felt 'immediately embraced' by the women of the kitchen who made her feel welcome on a personal level. Joined by Ms Ragland, she helped make chapatis and turn koftas on a grill as she launched the Together cookbook in a tent. In a speech to guests, she said the project had been a 'tremendous labour of love'. Ms Ragland embraced each of the women with a warm hug, telling them: 'It's amazing. I'm just as excited as you are. Speaking of the duchess's experience at the kitchen, she said: 'She felt very much at home. 'I'm so privileged to know you. Working on this project for the past nine months has been a tremendous labour of love. I have just recently moved to London and I felt so immediately embraced by the women in the kitchen, by your kindness and to be in this city and be in this room and see how multi-cultural it was. 'On a personal level I feel so proud to live in a city with so much diversity. This whole country is represented by the people in the kitchen. It's pretty outstanding. 'There's so many people to thank - I'm extremely grateful because this is my first project and I appreciate your support. It truly took a village to see this through. Everyone has embraced this so fully because it has been a passion project for us all. 'As I said this is more than a cook book and what I mean by that is the power of food is more than just the meal itself it is the story behind it. And when you get to know the story behind the recipe, you get to know the person behind it and help us celebrate what connects us rather than divides us. That is the ethos of Together. 'Thank you so much for letting me be part of this and letting me be on this adventure with you and I'm so excited to see the projects we will continue to do in your community and also how you will inspire people globally by sharing your stories and your recipes. It's so impactful. You can see that in just a few days alone what's happened and the book's not out yet. 'What you have been able to do is a testament to what that means to people. I'm so proud of you. The duchess and her mother, have not been seen in public together since the royal wedding in Windsor on May 19 and looked relaxed in each other's company. Ms Ragland was the surprise guest at the lunchtime event on Perk's Field, outside the Palace. Baroness Gail Rebuck, chair of publisher Penguin Random House, told Ms Ragland she must feel 'very proud' of the Duchess and her work on the cookbook. 'Head over heels,' she replied. The Duchess embraced her friends at the kitchen warmly with three kisses, visibly excited at the success of the book this week and the day of the launch. The trio, who at one point stood with their arms around one another in a line, made their way around four food stations, with the Duchess getting stuck in to help cook while her mother and husband watched on proudly. At the first stop, Ahlam Saeid showed off an enormous bowl of green rice. 'Oh I love that,' said Ms Ragland. 'That was the first thing I asked about' [after learning of the cook book]. 'Everyone's just hungry', said the duchess, laughing, as she added fresh mint and olive oil to the dish. 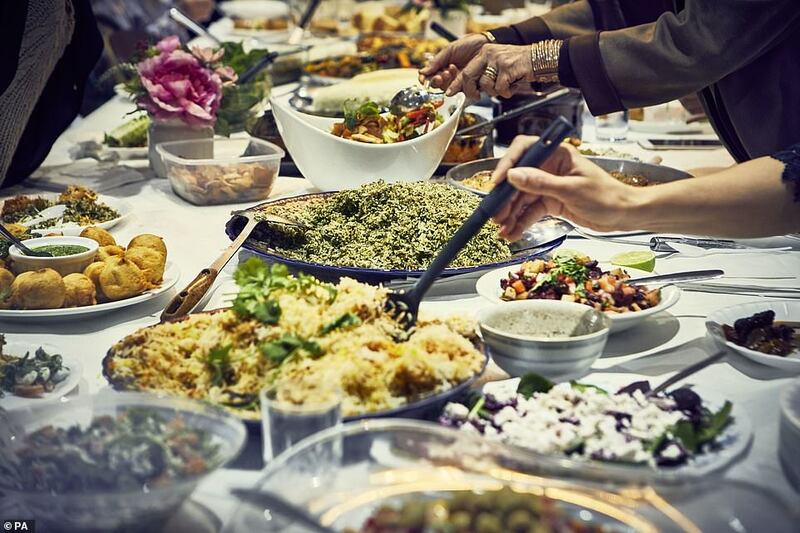 As they made their way through tables of salad, chapatis and kofta kebabs, Ms Ragland quizzed the cooks about the ingredients, listening carefully to the herbs and spices they described. She appeared to be an old hand in the kitchen, flipping chapatis confidently and turning koftas on the grill. 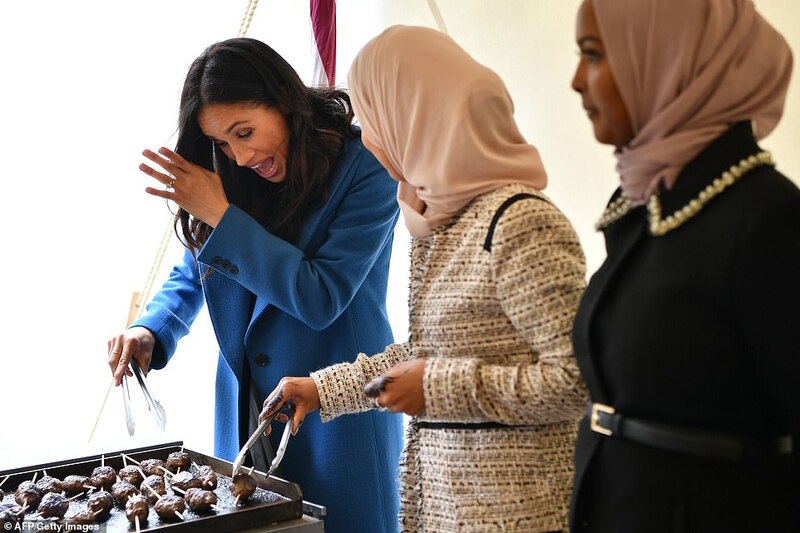 After guests were seated to tuck in to enormous plates of food, their hosts took a moment to look around the kitchen, based in the field's club house for one day only, before the duchess made a short speech. After lunch, the duke, duchess and Ms Ragland posed for a group photo with the women of the kitchen and their children before staying to chat. Standing with a small group of Hubb kitchen cooks as she said goodbye, she also gave an insight into where Meghan's own beliefs have come from. 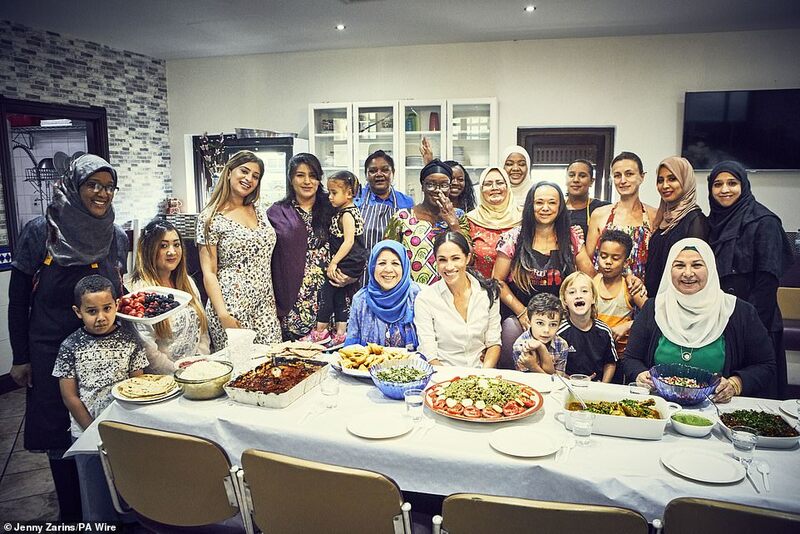 Meghan was reunited with the Grenfell community group who provided the dishes for Together, the fundraising publication aimed at supporting the local kitchen where the cooks meet in West London. The idea for the book came from the duchess after she was told, during her first private trip to the Hubb Community Kitchen in North Kensington, the facilities were only open two days a week because of a lack of funds. The women of the Hubb Community Kitchen showcased their own personal recipes featured in the cookbook, many of which have been handed down through generations. 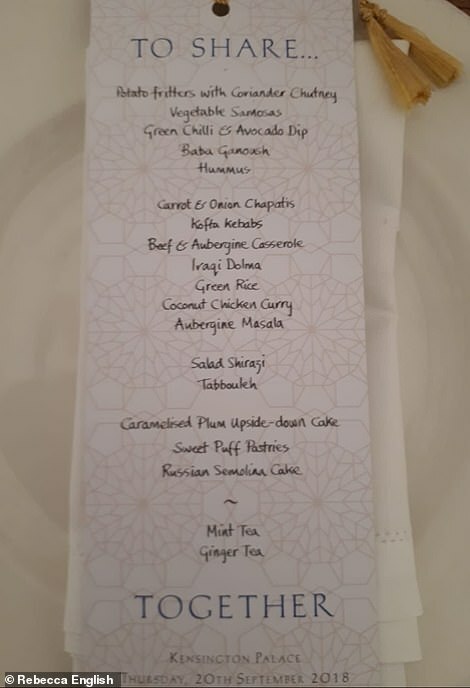 Guests enjoyed the home-made dishes including coconut chicken curry, aubergine masala and a range of chapatis and sharing dips, as well as caramelised plum upside-down cake, and spiced mint tea. 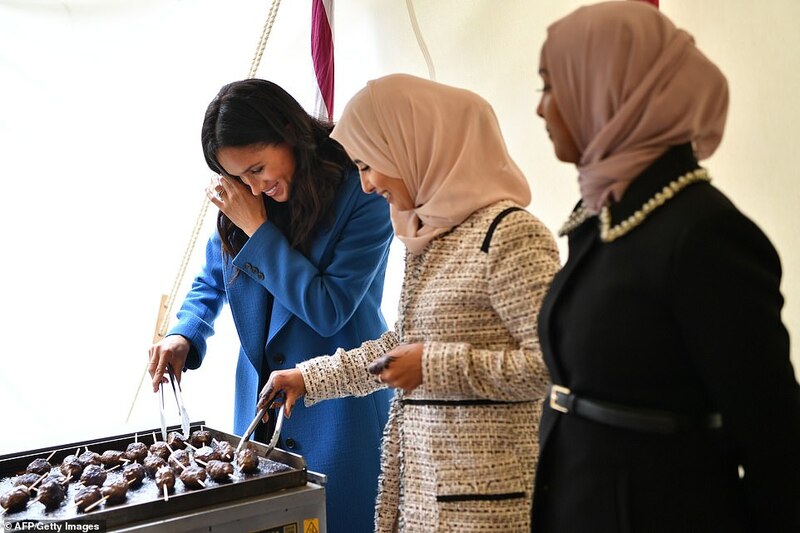 The duchess joined the women as they cook the dishes and assist with the preparations, before the group and the duke and duchess sat to enjoy the freshly made food with their guests. Meghan and her beloved mother Doria Ragland were together in public for the first time since the royal wedding today. The 62-year-old yoga instructor and social worker from California was the sole member Meghan's family at her wedding to Harry at Windsor Castle in May this year. She had tears in her eyes as her daughter was married to the sixth in line to the throne by the Archbishop of Canterbury. In a sign of how she has been accepted by the Royal Family, Doria left St George's Chapel on the arm of Prince Charles, who gave Meghan away. Doria's ex-husband Thomas, the Duchess of Sussex's father, had failed to walk her down the aisle after a heart attack and a paparazzi scandal that cast a shadow over the biggest day of his daughter's life. Mr Markle, 73, married Ms Ragland in 1979 but they were divorced nine years later when Meghan was just six. They had no other children, but Hollywood lighting director Thomas Markle has two more from his previous marriage. Meghan is understood to cut off contact with her father, who lives in Mexico, who has given a number of incendiary interviews about his youngest daughter and Harry. In contrast Ms Ragland has not spoken about Meghan's relationship and is understood to be a regular visitor to Kensington Palace. Guests also included members of the local community, representatives from Ebury Press - publishers of the book - the Al Manaar Muslim Cultural Heritage Centre, where the cooks are based, and the Royal Foundation. 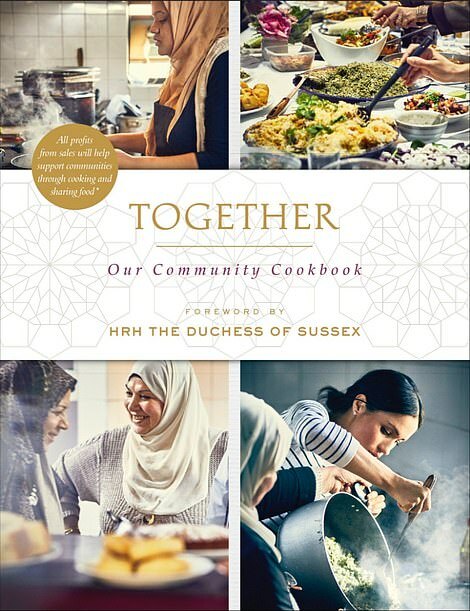 On Monday, as the duchess helped to release the new cookbook, it emerged that she made secret trips to a community mosque to cook with Grenfell Tower victims after the horrifying inferno that left 72 dead. 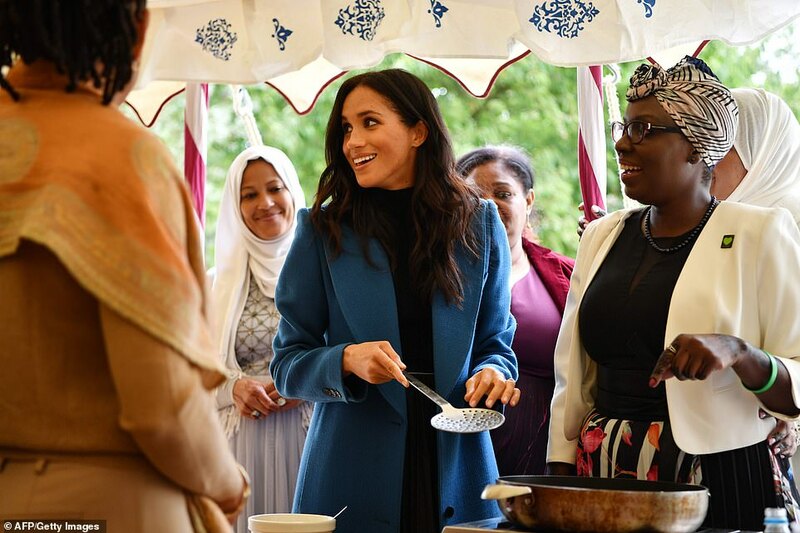 In her first solo project as a member of the royal family, Meghan wrote the foreword to the new book produced by cooks from the Hubb Community Kitchen, an initiative based near the site of the West London tower. 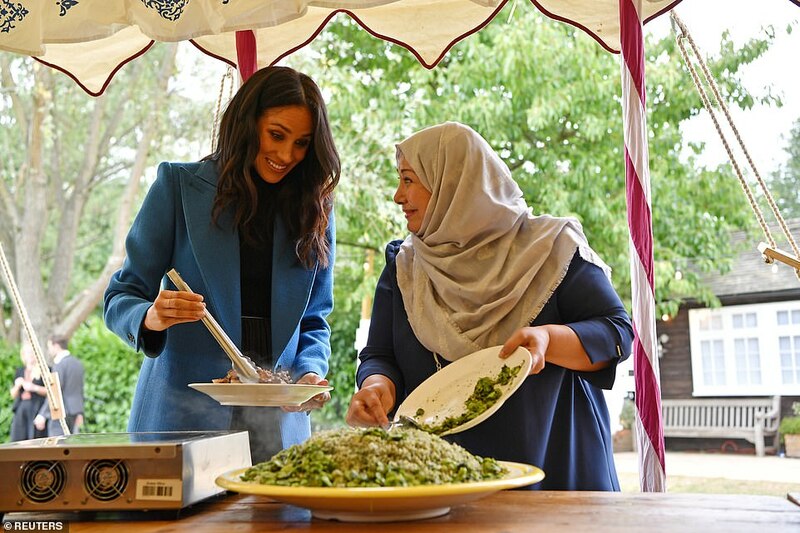 One of the contributors to the book, Munira Mahmud, 34, told how Meghan donned an apron and mucked in with the cooking, including washing rice. 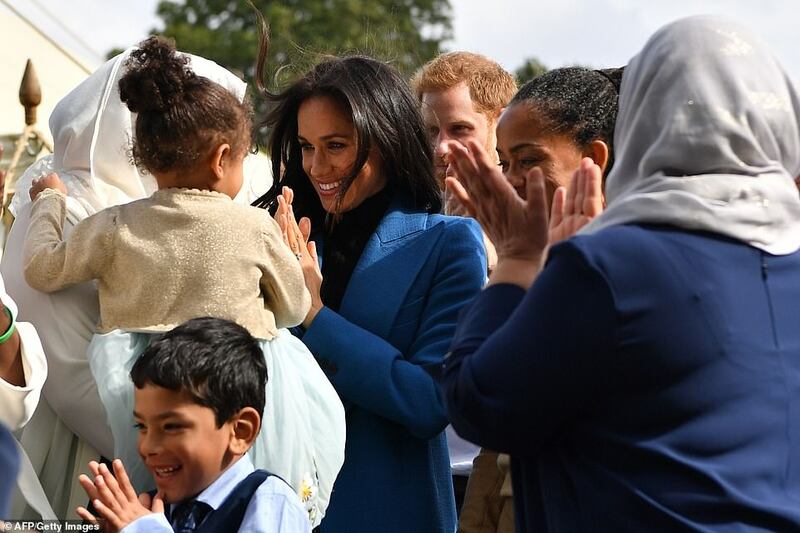 It also emerged on Monday that two of the women who worked on the cookbook with Meghan saved the lives of seven people from different families. 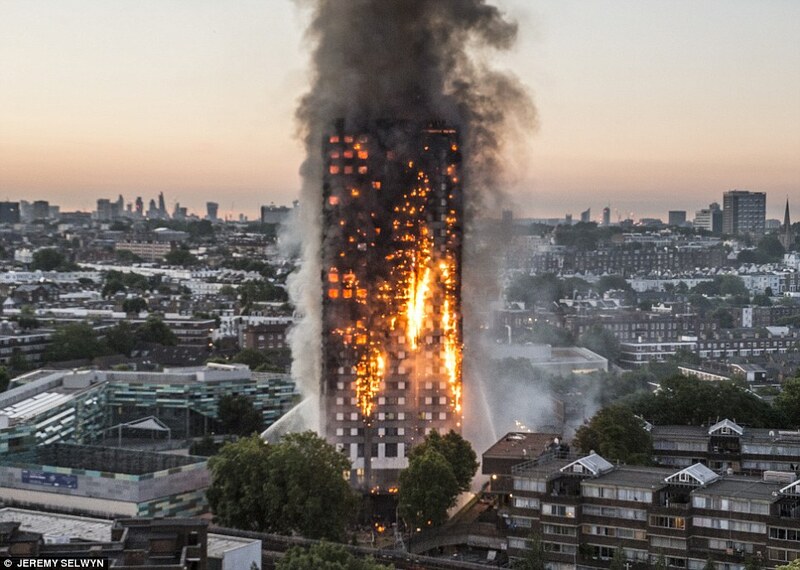 MailOnline revealed Hiwot Dagnachew was on the fifth floor and stopped her two great nieces from perishing in the blaze. It is unprecedented for family members to attend royal engagements. 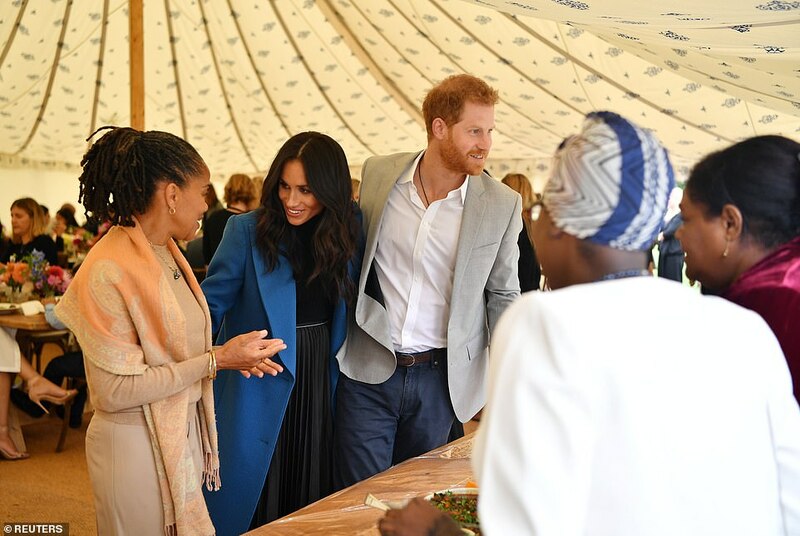 That is why the appearance of Doria Ragland alongside the Duchess of Sussex at the launch of her new charity cookbook so surprised royal watchers. Meghan's decision to bring her mother along to the Kensington Palace event is another sign of her willingness to gently push the boundaries of royal traditions. Other examples include inviting the charismatic US preacher Michael Curry to speak at St George's Chapel during the royal wedding, introducing a lively contrast to the sedate sermons typical of royal weddings. She has also pushed the boundaries of royal fashion etiquette, such as by wearing skirts and dresses that stop above the knee. 'Swapping family recipes and moments of laughter gave us a sense of normality and home. 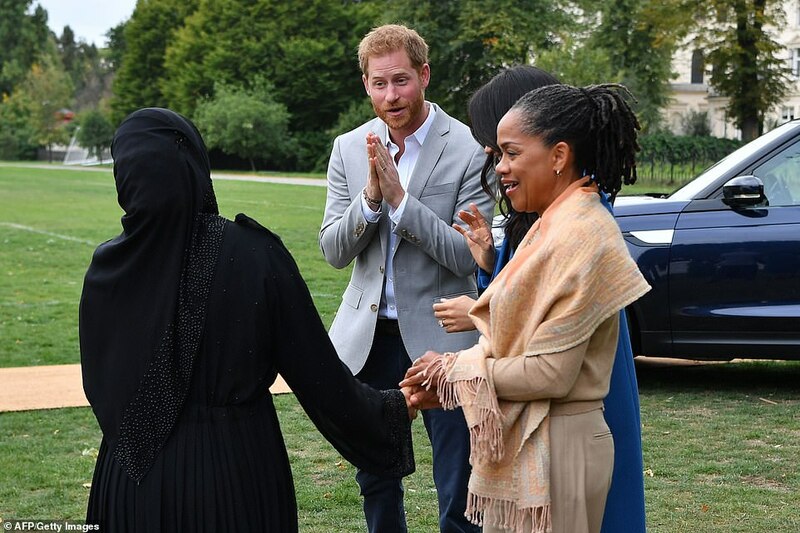 Doria Ragland has made several secret visits to Britain to comfort Meghan in the wake of her father's damaging outbursts, it was reported last month. On one occasion – in July – the social worker stayed with Harry and Meghan at their Oxfordshire cottage, the Mail On Sunday reported. Harry and Meghan have spent much of the summer at their 'safe haven' house on the Great Tew Estate. All proceeds will go back to the Hubb. 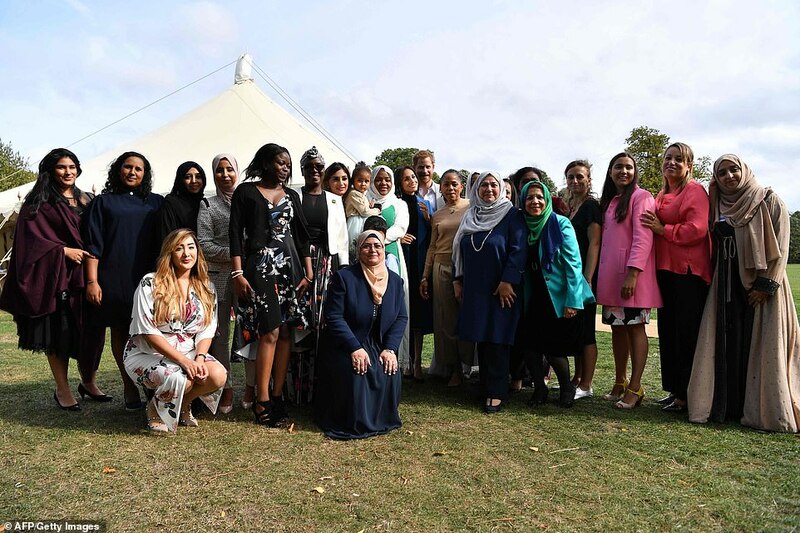 Baroness Rebuck DBE, chair of Penguin Random House, said: 'We were instantly caught up by the extraordinary vision for this project with the women of the Hubb Community Kitchen. Royal expert Charlie Jacoby told MailOnline: 'After the wedding that wowed the world, the Duchess of Sussex is extending the royal brand again. Together is more than a cookbook. This is a tale of friendship, and a story of togetherness. It is a homage to the power of cooking as a community, and the recipes that allow us to connect, share and look forward. In January 2018, as I was settling in to my new home of London, it was important to me to get to know organisations working in the local community. I made a quiet trip to Al-Manaar, a mosque close to the Grenfell community. 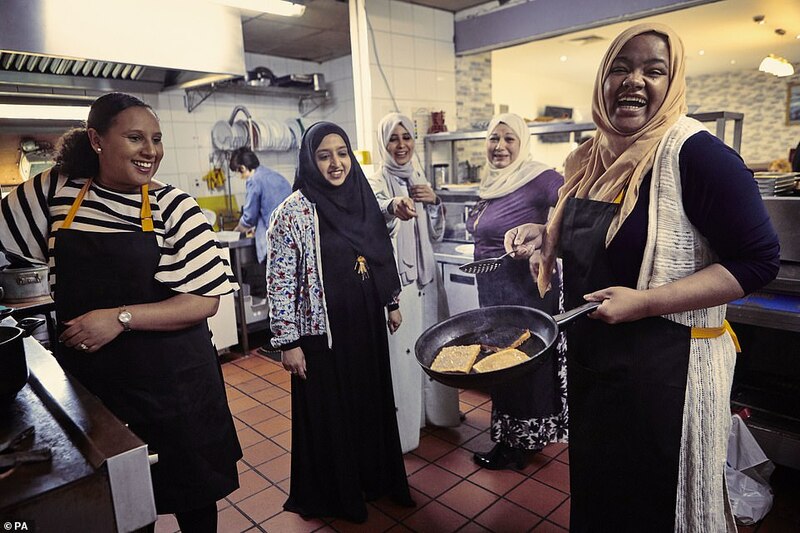 The kitchen was opened after the Grenfell tragedy, offering women who had been displaced and the community around them a space to cook food for their families. Their roles as matriachs united them across their cultures; the kitchen provided an opportunity to cook what they knew and to taste the memory of home, albeit homes some had recently lost. I have a lifelong interest in the story of food – where it comes from, why we embrace it and how it brings us together: the universal connection to community through the breaking of bread. 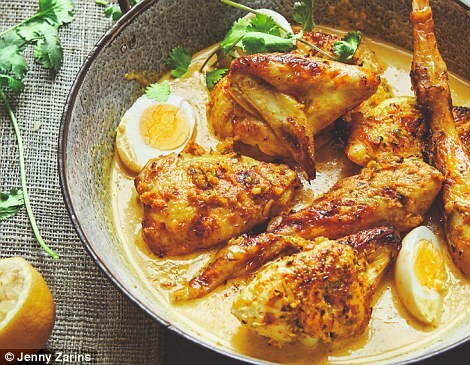 Within this kitchen's walls, there exists not only the communal bond of togetherness through sharing food, but also a cultural diversity that creates what I would describe as a passport on a plate: the power of a meal to take you to places you've never been, or transport you right back to where you came from. 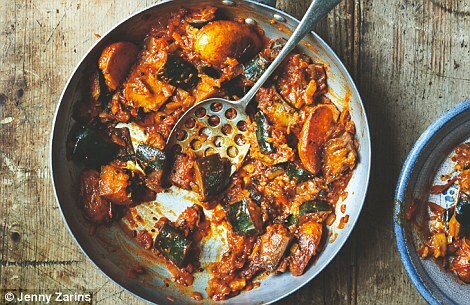 One of my own favourite meals is collard greens, black-eyed peas and cornbread – a meal I would look forward to throughout my childhood: the smell of yellow onions simmering amongst a slow-cooked pot of greens from my grandma's back garden; the earthy texture of peas; and a golden loaf of cornbread puff-puffing away to a browned peak in the warmth of the oven. I've spent many years away from my birthplace of Los Angeles and have found that travelling far from home highlights the power of personally meaningful recipes. During my time at university in Chicago I would wait with bated breath to return to LA for the winter break and have a bowl of my mother's gumbo. And while living in Toronto (seven years of being adopted by that beautiful place for work), I embraced poutine and several other Canadian culinary favourites, but the Southern California girl in me always craved fish tacos, and the memory of eating hometown fare infused with a strong Mexican influence. We've all had that experience where you have a bite of food, close your eyes, and taste, remember and even feel the first time you enjoyed it. There is good reason that chicken soup is often credited with healing not just a cold, but the soul. There is something quintessentially restorative about a taste of something meaningful. 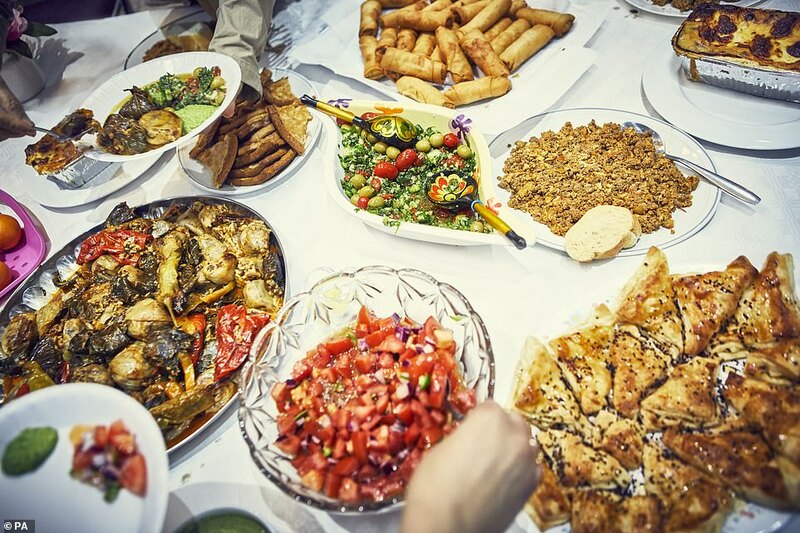 Melding cultural identities under a shared roof, it creates a space to feel a sense of normalcy – in its simplest form, the universal need to connect, nurture and commune through food, through crisis or joy – something we can all relate to. And now just a few months later, here we are… Together. Through this charitable endeavour, the proceeds will allow the kitchen to thrive and keep the global spirit of community alive. With the support of dynamic women from all walks of life, we have come together with a united vision to empower other women to share their stories through food. This cookbook is a celebration of life, community and the impact of coming together. Our hope is that within these pages you will find new recipes and family favourites that you can enjoy in your own homes, because these recipes aren't simply meals; they are stories of family, love, of survival and of connection. From a Thanksgiving supper to a Shabbat dinner or a Sunday roast, the meals that bring us together are the meals that allow us to grow, to listen, to engage and to be present. We invite you to do the same, together, in your home, communities and beyond.